A photograph of an unidentified house and outbuilding. A woman and child are sitting in a carriage attached to a horse and a man is holding on to the horse. 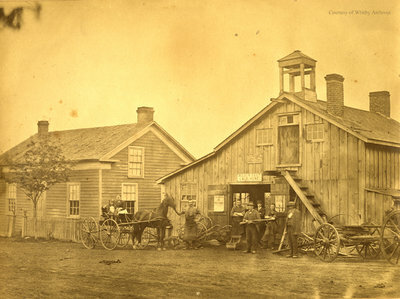 Five men are standing in front of the outbuilding. This photograph was found in the Archives storage room without any identification. Unidentified House and Outbuilding, Date Unknown, Photographer Unknown. Whitby Archives A2014_009_001.